TAYLOR SHERIDAN, the Oscar-nominated screenwriter of Hell or High Water, explains his movie's parallels with today’s ugly America, and offers thoughts on why a President Trump may have been not just possible, but inevitable. 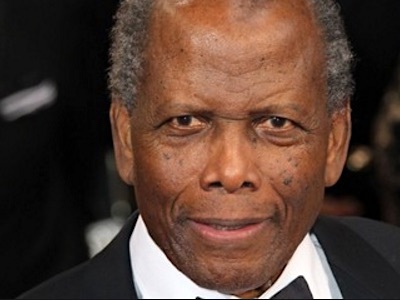 SIDNEY POITIER, 90 years young today, has been a touchstone and a sounding board for generations of black and minority filmmakers hoping to make their mark on the most popular art form in the world. On the occasion of the birthday of the award-winning icon — now the oldest living Best Actor Oscar winner — I’m revisiting an interview I had with him in February 1989, while working on the culture desk of The New York Times. Reading it again, I’m confident that his sense of mission, purpose and clear-eyed intention — not just about the movies but also about life — hasn’t dimmed. We dabble in parlor-game theories about What's Wrong With Him ... .. and avoid going where that speculation ultimately leads — to that unsettling thought of how it’s really about what’s wrong with us. 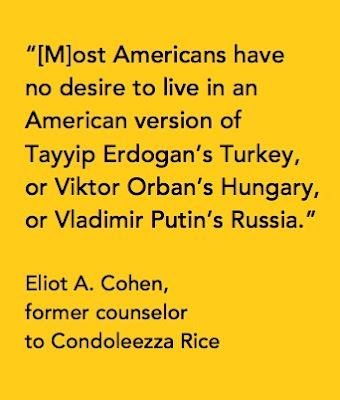 Read the full piece at The Swamp. Image credit: Andrew Harnik/Associated Press. IF THINGS AROUND you seemed to be a little different on Thursday — your favorite restaurant closed, the workplace less populated, the businesses you frequent more at a loss for customer service than usual, maybe even less art on the walls of the museum you love — it wasn’t your imagination. 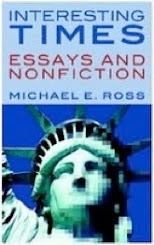 In response to POTUSINO Donald Trump’s attempted travel ban of people from seven Muslim-majority nations and the blitzkrieg ICE raids on undocumented immigrants across America last weekend, some institutions and ordinary everyday people have hit on the idea of letting the nation know, at least for a brief while, what America without immigrants looks like. 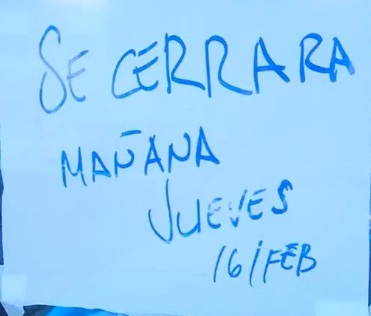 Immigrants across the country missed work, skipped classes, closed businesses and refuse to patronize businesses on Thursday. It was a full-on wildcat national event, with restaurant closings in Philadelphia, Washington, New York, San Francisco, Boston, Indianapolis (Mike Pence country), Roslynn, Va.; Dallas and Austin, Texas. 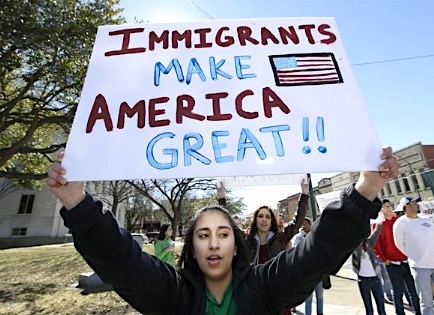 The "Day Without Immigrants" protest stepped off across the country, showing in unmistakable ways just how valuable and necessary immigrants’ contributions are to the economic lifeblood of the United States. The immediate impact is necessarily more symbolic than anything else. But it taps into a wider pro-immigration narrative, still largely unspoken, that could galvanize Latino voters and younger voters — and more besides — in the runup to the 2018 elections. “Immigrants are the backbone of this country and the heart and soul of the service industry," said Matt Carr, owner of Little Red Fox, a restaurant in Washington, D.C., to CNN. "Without them, our small businesses would crumble. They are also part of our family here at Little Red Fox, and I, too, am worried about their future under this administration." Carr’s immigrant workers took the day off, but not before working extra the day before, making sure the restaurant was good to go in their absence. 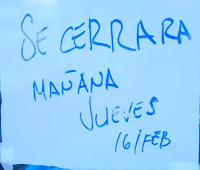 IRONICALLY, SOME employers validated the very point of the protest, confirming in punitive ways the centrality of the immigrant workers' importance. In Lexington County, S.C., 21 workers were fired from their jobs at Encore Boat Builders LLC for taking the day off to attend the protest there. They may or may not have legal recourse; South Carolina is a right-to-work state, a fact that gives employers a lot more latitude in dismissing workers who don’t toe the mark for any reason. Whitney Falloon wrote a great day-of story in Eater, a piece that details how it is for one man with another kind of skin in the game. “Busboys and Poets, one of D.C.’s most political restaurants that once hosted President Obama for lunch, is closing all six of its locations today, a move that owner Andy Shallal says will cost “tens of thousands of dollars.” For Shallal, who was born in Iraq and once ran for mayor, the choice was clear. The ascension of Trump and his repressive policies vis-à-vis immigration, race and ethnicity have also sparked reactions, panoramic and passionate, from the art world. Maybe none's been more dramatic and visceral than what the Davis Museum at Wellesley College is doing. Katherine Brooks of The Huffington Post reported Wednesday on the Davis’ initiative to alert the public to immigrant contributions to art: the museum has either temporarily taken own or shrouded all artwork by immigrants, as well as any art donated to the Davis by immigrants, from Thursday, until Tuesday, Feb. 21. 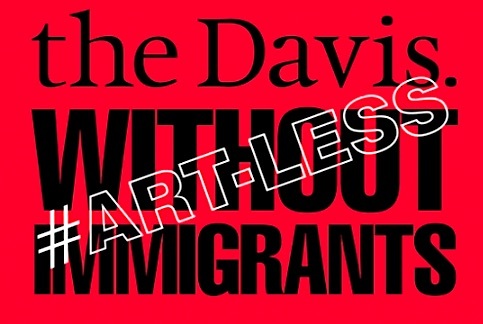 Under the protest, called “Art-Less,” the museum has de-installed or outright concealed 120 works of art, including paintings, sculptures and other works from its American, African and European collections, and others. APPROXIMATELY twenty percent of the works of art on view in our permanent collections galleries were created by artists or donated by collectors who immigrated to the United States,” the museum said in a statement on its web site. 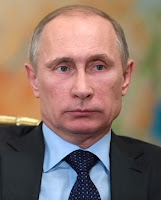 ELECTIONS HAVE consequences,” Republicans are fond of saying. The Trump White House has found out — in swift and unspinnable events over the last 12 hours — that those consequences can be as ominous and pivotal for the winner as they’re assumed to be for the loser. Within the administration, there’s resistance to some in the current Trump inner circle. Within the government writ large, there’s resistance to the Trump White House’s interpretation of the law. Either way, a fledgling administration is discovering that this is what democracy really looks like. “Our Intelligence Community is so worried by the unprecedented problems of the Trump administration—not only do senior officials possess troubling ties to the Kremlin, there are nagging questions about basic competence regarding Team Trump — that it is beginning to withhold intelligence from a White House which our spies do not trust. “Trump’s personal national security guru can’t seem to keep his story straight on vital issues. “That’s Mike Flynn, the retired Army three-star general who now heads the National Security Council. Widely disliked in Washington for his brash personality and preference for conspiracy-theorizing over intelligence facts, Flynn was fired as head of the Defense Intelligence Agency for managerial incompetence and poor judgment — flaws he has brought to the far more powerful and political NSC. “Flynn’s problems with the truth have been laid bare by the growing scandal about his dealings with Moscow. Strange ties to the Kremlin, including Vladimir Putin himself, have dogged Flynn since he left DIA, and concerns about his judgment have risen considerably since it was revealed that after the November 8 election, Flynn repeatedly called the Russian embassy in Washington to discuss the transition. The White House has denied that anything substantive came up in conversations between Flynn and Sergei Kislyak, the Russian ambassador. 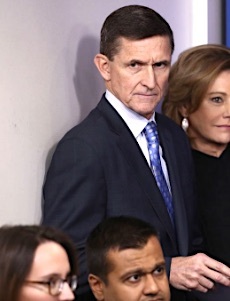 Flynn’s enhanced exit from the Trump White House is the most recent hobbling of an administration that deeply (and wrongly) believes in exertion of willpower as the primary determinant — maybe the only determinant — in achieving things in Washington. Earlier Monday, U.S. District Judge Leonie Brinkema granted a preliminary injunction that blocks the Trump administration from implementing the deeply divisive Muslim ban that was, rhetorically and ethnically, a cornerstone of the edifice of emotionalism that typified much of Trump's 18-month performance-art campaign for the presidency. 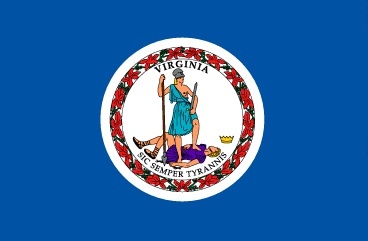 Her ruling is only applicable in the state of Virginia, and is expected to stay in force until a trial case is completed. FOR ALL the attention Donald Trump has lavished on keeping a malign campaign promise on immigration — taking steps to fortify the southern border of the United States by building $20 billion of physical wall; a breathtakingly cruel weekend sweep of several locations in the United States; arresting immigrants in unannounced ICE raids almost Orwellian in their swiftness, style and indifferent impact — his more immediate global concern is more likely to come from a different direction. Recent events suggest Trump shouldn’t be looking south right now, but east. On Thursday, the president-apparent was handed his latest foreign policy challenges, The first, older one yielded a tragic embarrassment, the next one was something of a serial humiliation. How the last one plays out remains to be seen. Challenge #1 was navigating the fallout from the botched raid in Yemen, a late January incident that, according to several reports, resulted in a 50-minute firefight, at least a dozen Yemeni civilian casualties and, according to the facts, the death of a Navy SEAL. The Trump White House has been furiously spinning that as no worse than a stalemate and a visceral stand on Trumpian campaign principles, or, in their eyes, a flat-out qualified success. But on Thursday, Trump accepted the one China policy in force between Washington and Beijing for 40 years, a policy that insists that Taiwan is a breakaway province of mainland China, and geopolitically nothing more. 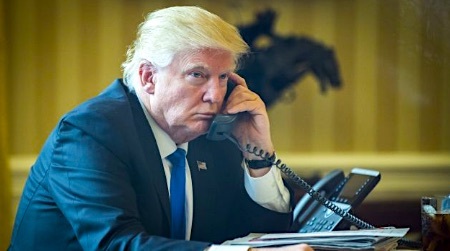 And Trump did so with a phone call with Chinese President Xi Jinping, a phone call that is very much a matter of the historical record. There was no spinning this — by White House Press Yutz Sean Spicer, Chief of Stuff Reince Priebus or anyone else. Trump was effectively schooled on life in the geopolitical playground by the leader of the world’s most provocatively explosive economy ... and Trump caved. Folded like a table at a flea market. 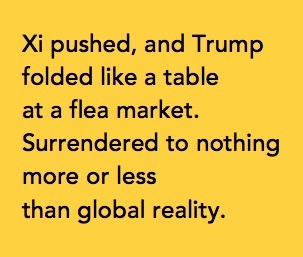 Surrendered to the weight of nothing more or less than a situation he could not tweak, bully or control: Global reality. It all came down to one sentence from the Trump White House: “President Trump agreed, at the request of President Xi, to honor our ‘One China’ policy.” Challenge #2, part one. AND DON’T THINK this ends the rift between Washington and Beijing. There will be some residual resentment, to be sure, and a sense on Beijing’s part that only a rank amateur would have let things get this bad — in two inescapable ways. First there was the December phone call with Taiwanese president Tsai Ing-wen, a call that broke with policy in place since 1979. But there’s more than that. It got worse. 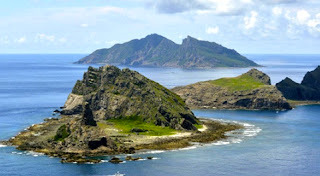 Chang in The Beast: “On Saturday [Feb. 4], [Secretary of Defense James] Mattis reaffirmed that Article 5 of the U.S.-Japan mutual defense treaty covers the Senkaku Islands in the East China Sea, pledging Washington to defend them from attack. The only country threatening the barren outcroppings is China, which claims sovereignty. 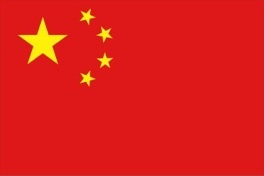 Beijing for years has been pressuring Japan to hand them over. 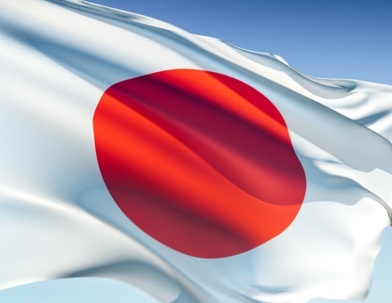 “Just two days after Mattis issued his confirmation, three Chinese coast guard vessels, without permission, intruded into Japan’s territorial waters around the Senkakus. The intrusion is seen as a warning to Tokyo and the United States.” Challenge #2, part two. In the past, Kim Jon Un, the leader of North Korea, has made it a stated priority for his country to step up development of nuclear missiles that can hit Japan and the U.S. mainland. They’ve been practicing; North Korea conducted more than two dozen such tests last year. What happened on Saturday (Sunday in the region) may be a leading indicator of that intention. Or not. TURNS OUT the president-presumptive of the United States has home-wrecking capabilities we didn’t know anything about. TheGrio.com reported on Tuesday on a couple that’s taken political differences about as far as you can go. 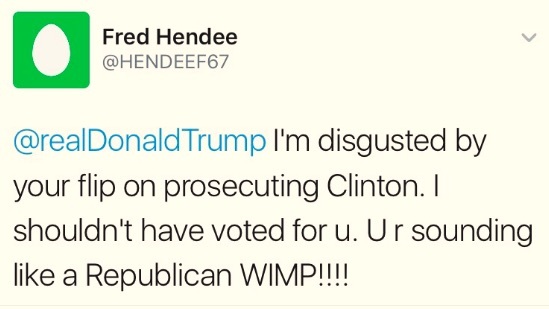 Gayle McCormick, who described herself for TheGrio as a “Democrat leaning toward socialist,” was personally aghast when her husband of 22 years announced his intention to vote for Donald Trump. “It totally undid me that he could vote for Trump,” said McCormick, 73. 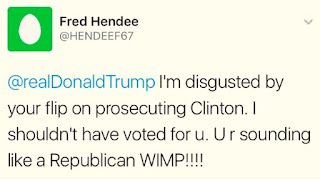 She said she’d never thought of leaving him before for his conservative views, but added that she felt “betrayed” by his vote for Trump. McCormick obviously has her regrets about recent events. It’s a safe bet her husband may well have too, but maybe not just for personal reasons. In the last 21 days, since The Donald assumed the White House, regrets about the Trump White House have been emerging, regrets from those who voted for Trump in November and who now wish like hell they had that vote back again. Not long after the election, someone created the Tumblr. page Trumpgrets, which catalogs the buyers’ remorse Americans have been feeling since Election Night. There’s also a similarly-themed Facebook page. 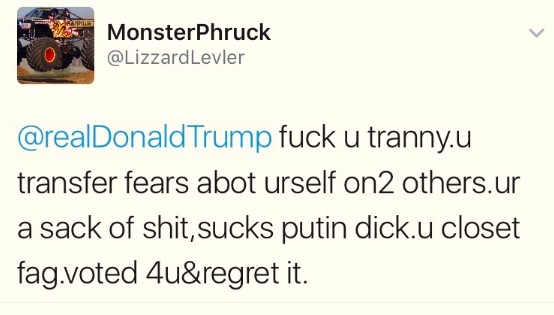 And as you might expect, regrets aplenty have surfaced on Twitter, Trump’s favorite form of communication. 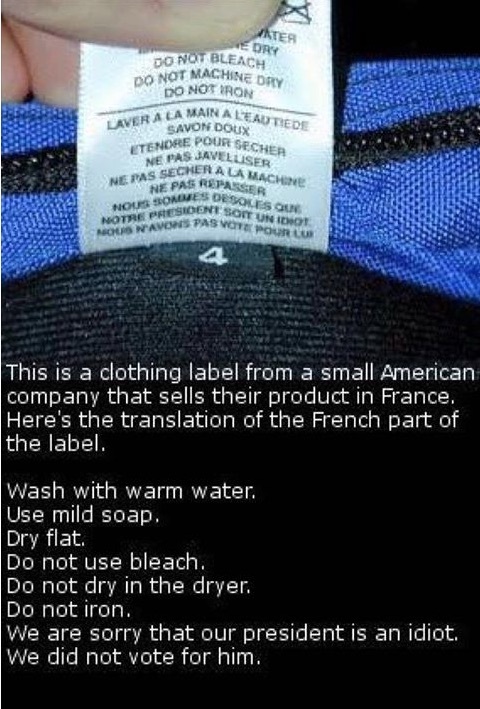 But the Trump regret cottage industry that’s so rapidly expanding is more than just citizens letting off steam. 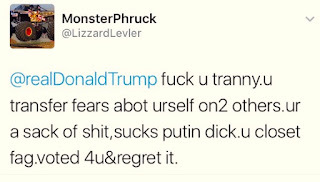 More and more often, objections are growing among the very people Trump needs to have any chance of success: The people who’ve been in and of Washington for years before he got there. ELIOT A. Cohen, for three years a counselor to former secretary of state Condoleezza Rice, wrote a brilliant piece — hard-nosed but hopeful — in The Atlantic late last month. But a growing cross-section of Republicans, from voters to power brokers on the Hill to the infrastructure of the government over which Trump now presides, is expressing the deepest reservations about voting for him, and doing so for reasons that go beyond the partisanship of the moment. For them, it’s a matter of the party’s basic survival beyond the grievous unforced error of their own making last Election Day. 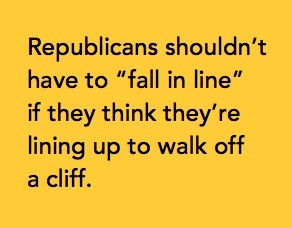 What’s developing is their liberating belief in a real-time Exception to Rule #1: Republicans shouldn’t have to “fall in line” if they think they’re lining up to walk off a cliff. Tweets are the property of their respective creators. 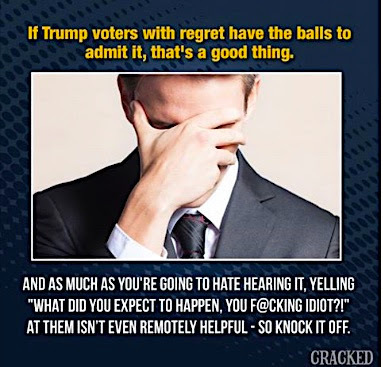 Regrets graphic: Cracked.com. There’s a rule about old clothes: Don’t throw anything away; it will always come back in style. What looks like another shot at the current occupant of the White House apparently isn’t that at all. Bradbury’s FB friends told him the label was first reported about sometime in 2004 — during the administration of George W. Bush. The maker of the article in the photo was said to be Tom Bihn, a Seattle-based maker of travel goods that’s been in business since 1972. No way to know whether Tom Bihn plans to put the 2004 tags on its current products. If so, of course, there won’t be much to do. Some things never change. THESE ARE THE DAYS that try writers’ souls ... and burn out the batteries in their wireless keyboards, fast. He told us this was coming, he warned us that what he said he would do is what he would do ... and here we are. The last twenty days have alerted us to just how resilient and how fragile our American democracy really is. In successive days and weeks, from almost the moment of his inauguration, President-presumptive Donald Trump has cemented his legacy as the most poorly received freshman president in modern American history. 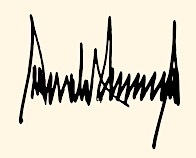 We’re just weeks into a flurry of executive orders from TheTrump™ and we fully absorb one body blow before we have to react to the next one. There’s fear afoot; it feels like we’re on a cliff whose angle of climb is steepening while we’re on it; we’re game but the aching fear is that we’re quietly holding onto the last handhold on the cliff wall, with a fraudulent sang-froid. 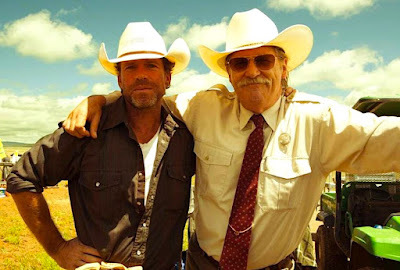 We try to cope, retreating to snark and quips on the social tip, all of us captives of a madman with a gun holding us hostage, But there’s hope — not just hope but real action. 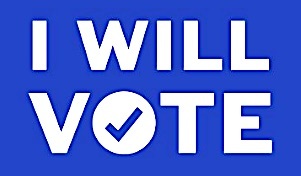 We’re defiant at the grassroots, pushing back hard in a broad swath of rejection of the Trumpian status quo, a civic engagement that bridges the usual demographics, a movement we haven’t seen this ecumenical and expanding since the height of the Vietnam War. 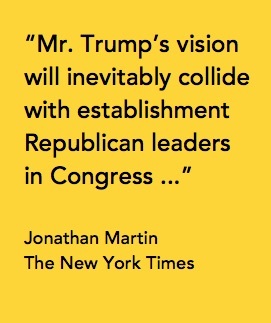 Note to Trump White House & Brain Trust: This is what populism really looks like. 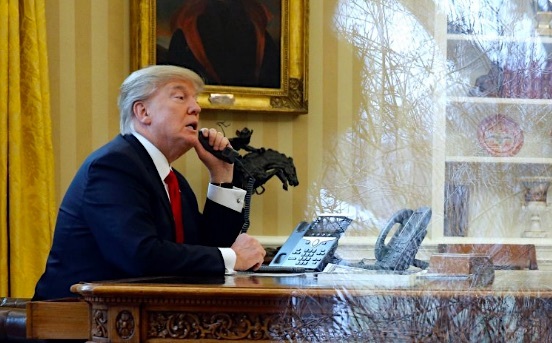 In the last three weeks, in belligerent phone calls and tweets calling long-held protocols and agreements into question, Trump alienated and antagonized Mexico, Australia and China. He apparently soft-pedaled his own previous full-throated support for more Israeli settlements and side-stepped a campaign pledge to move the U.S. embassy to Jerusalem (potentially antagonizing Israel). 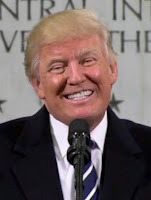 After a series of ugly comments about the U.S. intelligence community, after skipping out on the intel briefings that would presumably make him a more learned president, Trump went to the headquarters of the Central Intelligence Agency and embarrassed himself in front of a CIA monument to its unsung heroes — those who died in defense of the country — by yammering on and on about the number of people who attended his inauguration. 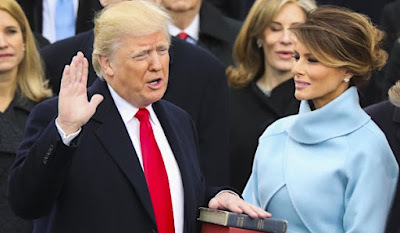 He kept one of his original campaign pledges by signing executive orders ordering the government to start building a wall along the Southern border with Mexico, a project estimated by the Homeland Security Department to cost up to $22 billion, and take more than three years to complete. Trump also told Homeland Security and the Justice Department to cut federal funds from sanctuary cities. 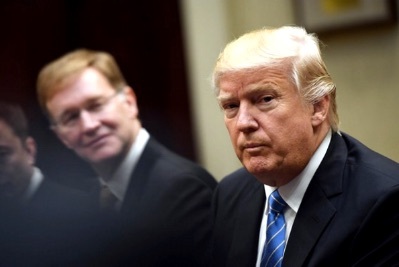 TRUMP approved, via executive order, construction of the Keystone XL and Dakota Access oil pipelines, both sidelined indefinitely by President Obama over mounting environmental concerns. He repeated numerous times his utterly fanciful claim that voter fraud kept him from winning the November election by the landslide proportion he’s conjured in his own mind since shortly after the election was over. 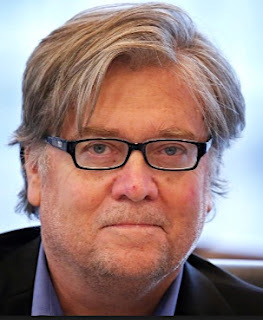 On Jan. 28, Trump named Stephen Bannon, his newly-minted chief White House strategist and a man deep in the embrace of white nationalism, to take a seat on the National Security Council. He signed an executive order to begin the unraveling of the Dodd-Frank financial reform law, which gave the Federal Reserve wide latitude in regulating the nation’s banks, a direct response by President Obama to the 2008 financial crisis. And in a perversely cruel capstone action of his young administration, Trump signed an executive order banning visitors and refugees from seven Muslim-majority nations from coming to America for 90 days. Syrian refugees are barred indefinitely. On Jan. 30, in response to the TrumpWall executive order, Acting Attorney General Sally Yates, an Obama White House holdover with the courage to stay on through the opening of the Trump hellscape, refused to defend the Muslim ban in court. 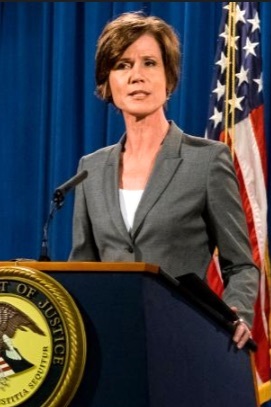 “I am responsible for ensuring that the positions we take in court remain consistent with this institution’s solemn obligation to always seek justice and stand for what is right,” Yates wrote in a statement. “At the present, I am not convinced that the defense of the Executive Order is consistent with these responsibilities, nor am I convinced that the Executive Order is lawful.” Yates was fired hours later, in a blisteringly nasty Trumpian rebuke. IN A conference with sheriffs and law enforcement officials, a sheriff from Texas tells Trump about a state senator who’s making a fuss about ensuring that civil asset forfeiture takes place after a person is convicted of a crime, not before. Trump offers to “destroy” the senator’s career. And the first flex of Trumpian military muscle — a Trump-authorized strike last month targeting al-Qaida militants in Yemen (through an executive order that wasn’t fully vetted) — was apparently less than successful. 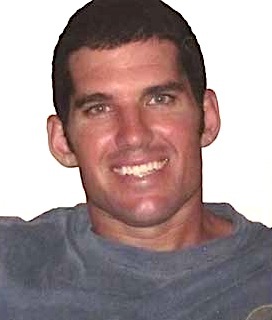 Civilians died in a firefight; a Navy SEAL, Chief Petty Officer William “Ryan” Owens was killed ... and as of Tuesday, Trump’s 17th full day in the White House, Yemen withdrew its permission to allow anti-terrorism ground missions by U.S. Special Forces. In The Intercept, Maass hit on one of the perfect metaphors to describe what has become a genuinely existential crisis for this country: the process of drowning. Maas is as gifted a stylist and acute an observer as they come, but this metaphor leaves too much to chance. This isn’t aquatic happenstance, being in the wrong place at the wrong time. This is all too deliberate. This is another kind of drowning, the kind that Trump wants reinstated as American policy for dealing with people it doesn't like. What we’re experiencing now is a waterboarding of American values and the best parts of the country’s political culture. How this all turns out depends bigly on the protests that have rocked the nation since the day of the inauguration. They’ve been strong and ecumenical and exactly the kind of (really) populist endeavors the country needs. Here’s hoping they continue. Without such strong stands on principle, without continued momentum, we may find that what we’ve been living for the past three weeks could metastasize over the next three or four years. It’s not over, it’s barely begun. Stay woke. 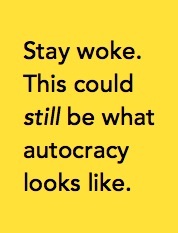 This could still be what autocracy looks like. Image credits: Trump: Matt McClain/The Washington Post via Getty. Trump at CIA: CBS News. Bannon: Carlo Allegri/Reuters. Sally Yates: Pete Marovich/Getty Images. William Owens: Navy Times. IN CASE YOU missed it yesterday, the Trump travesty of the day didn’t take place at the White House — not the one that dominated that news cycle, anyway. 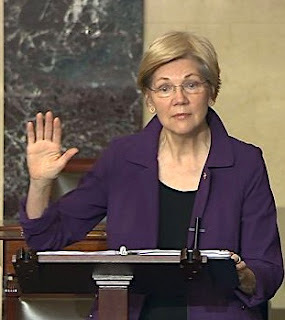 It happened on the Senate floor, when Senate Majority Leader/chinless wonder Mitch McConnell (with 49 other Republicans) silenced Massachusetts Sen. Elizabeth Warren while she was speaking on the Senate floor. Well, not just speaking, really. Warren does that very well on her own. But she was actually reading a letter into the Senate record on Tuesday, the day before the vote to decide whether Jefferson Beauregard Sessions III, the Alabama Republican senator and segregationist, becomes the next Attorney General of the United States and furthers the intention of his master, president-presumptive Donald Trump, and the right-wing ideologues on Capitol Hill: namely, to do everything they can to roll back social progress, retard efforts to achieve equality, and stymie any of the fragile advances made in race relations as far and as long as they possibly can. The letter was written by Coretta Scott King, routinely appendaged in history to her husband, Rev. Martin Luther King Jr., but very much a drum major for justice in her own right. She wrote the letter to Senate Judiciary Committee Chairman Strom Thurmond in March 1986, to express her objection to one Jeff Sessions (then a United States Attorney) being named to a federal judgeship. 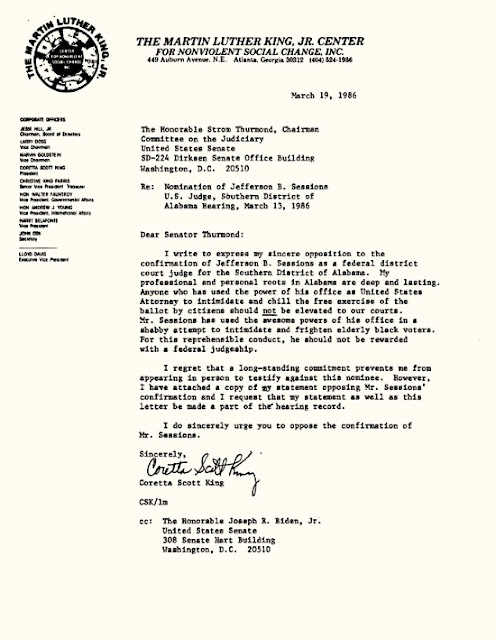 The letter, and a full statement of her opposition, were written because of Sessions' segregationist leanings; his record of voter intimidation; his periodic incivilities including peppering of his speech with the N-word; and (then and now) his strongly suggested desire to overturn or dismantle many of the social advances that Coretta King’s husband is now and will always be known for. The vote on the Sessions nomination to be the nation's top law enforcement officer is today, Wednesday. 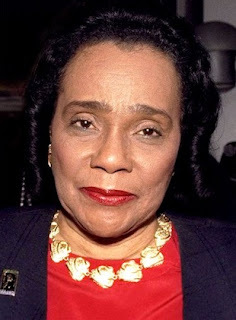 Coretta Scott King passed in January 2006, almost exactly 11 years ago. Few things you'll read anywhere this year will matter as much; few votes will resonate more deeply and indelibly than the one today. Read her full statement to the Senate Judiciary Committee here.